The best memories I have of my childhood are ones where I would wake up on a Sunday morning and prepare the charcoal smoker with my dad. This was not just for Super Bowl Sunday, it was for every Sunday that football was on TV. This was a family tradition that I would never miss, starting from when I was 3, until this day. Every Sunday, I would wake up and clean up the grill and prep for Sunday football. I have a lot of great memories with this tradition; I first introduced my wife to my parents during this tradition, and my first son was conceived on one of these days and then born on a football Sunday. Finding the best charcoal smoker is not all about hot dogs, beer and football; it is much more. It is about bringing families together for a strong bond. You must get the best charcoal grill to make the best barbecue, and this list of the 10 best grills will help you with that. When is the food grilled properly? Should You Upgrade Your Smoker? Here at Grills Forever, we’ve picked out 10 of the best charcoal smokers, from affordable portable grills to the high-end, heavy-duty units. We wanted to find an efficient charcoal grill that could actually give a rich flavor without the hassle of waiting for the grill to heat up! 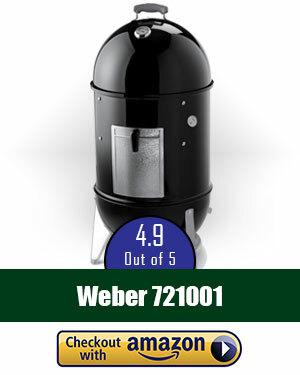 After testing over 40 charcoal smokers over 4 years and after 55 hours of research, we’ve selected what we consider to be the best charcoal smoker in the market today: the Weber 721001 Smokey Mountain Cooker. It meets several of the positive features we’re looking for, especially the capacity, ease of use, and portability. With enameled water pan, 8hr burn from 1 load of charcoal, and heavy duty grates, this Weber smoker will amaze and delight even the toughest taster. Juicy smoked meat for $250-330. Buy it from Amazon! ($329.00) Prices are accurate as of 23 Apr 2019 at 11:50 PM . Product Prices and availability are subject to change. Any price and availability information displayed on Amazon at the time of purchase will apply to the purchase of any products. It’s very typical of smokers and charcoal grills to affect all the rich flavors of the different meats by adding the metallic, tangy smell and taste; However, with this unit, we found no problem with that. At under $300, this porcelain-coated machine with 481 square inches of cooking space can use an entire batch of coal for 8 hours of straight grilling, perfect for big-scale events like backyard parties. The best feature we found was its porcelain-enameled water pan, which adds steam during the cooking process, making the most tender and moist meats. We found that the unit had no problem retaining flavor, and made the best grilled BBQ among the other choices in our top ten. At a tiny $50 this Weber portable model gets the job done anytime anywhere at a great low price. 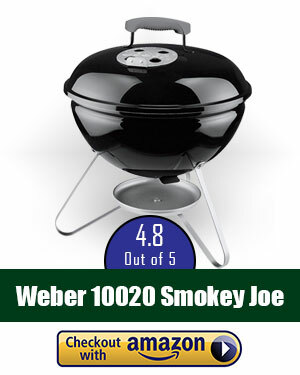 Durable for smoking and grilling this unit's backed by a 10yr warranty. Buy it from Amazon! ($34.99) Prices are accurate as of 23 Apr 2019 at 11:50 PM . Product Prices and availability are subject to change. Any price and availability information displayed on Amazon at the time of purchase will apply to the purchase of any products. At under $50, this extremely affordable unit comes with a variety of great features that make it a real investment even for the beginners. It’s slightly bigger than your typical portable charcoal smoker, measuring 14.5 inches in its interior, which is just enough cooking space to cook for 3 to 4 persons. Because of its small size, it is very easy to transport especially during camping trips. It also comes with a useful 10-year warranty, ensuring that this charcoal smoker is going to stay with you for a long time. With reinforced cool to the touch handles on the unit, not just the lid, this tailgating masterpiece can be moved anywhere even when still hot. 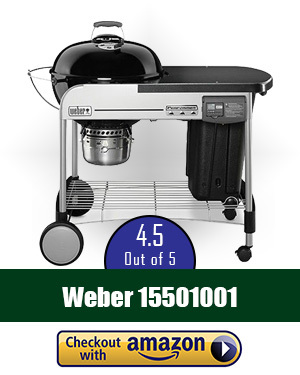 This Weber unit comes in under $50. Buy it from Amazon! ($54.99) Prices are accurate as of 23 Apr 2019 at 11:50 PM . Product Prices and availability are subject to change. Any price and availability information displayed on Amazon at the time of purchase will apply to the purchase of any products. Tailgaters and campers will love this portable pick that costs under $50. A box shape, this machine comes with steel legs that can be adjusted and folded for security and portability, even on uneven surfaces. It features 160 square inches of cooking space that lets you cook for a few people, ideal for smaller gatherings. 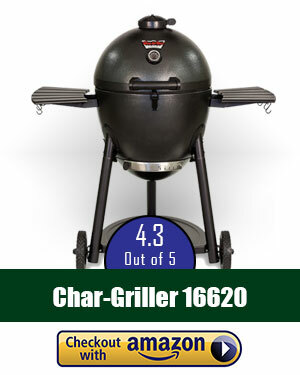 When we did our research on this product, we found that customers were very satisfied with this charcoal grill — it was affordable but it was still made with the highest standards. For capacity and size reasons, we ranked it slightly lower because it isn’t the best choice if you wanna host large cookouts. My team and I have studied and researched charcoal smokers for over 4 years in order to make this list absolutely accurate. The reason the Grills Forever team got into this work was simply because we wanted to enhance the experience of these traditions as families grow larger and larger as time progresses, so that we are getting the best quality grilling done to feed our people. 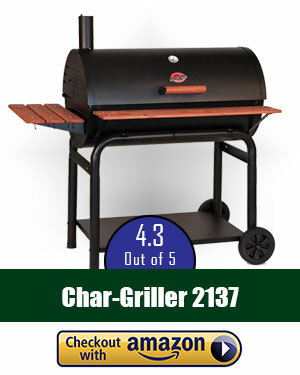 We considered over 40 of the charcoal grill smokers on the market and tested up to 20 of these products for this list. A combined 55 hours of research was dedicated by our team in creating this list to help you pick out the best charcoal smoker for a quality grill. This 55 hours included hours used in part to do web research, and the rest on actually physically testing the products with experts. These experts came in handy when we wanted to determine how well grills preserved the flavor, or how smokey the meats would taste after, or how long it would take to heat up. These are some questions among several we wanted to be answered because that is what matters most to consumers when they are buying a grill. With these things in mind and considering some of the other important features, we picked out the most effective charcoal smokers on the market. Please bear in mind that we’ve prepared this list only to help you select the best charcoal smoker out there. Our intent was not to promote any particular brand or product. People who like the authentic taste of smoked food: The best meals we had on Sundays were those we could also enjoy on other days after the cookout. The food tasted good smoked, rather than tasting like charcoal. This is an important factor for all great grills, they must grill the meats without making it taste like charcoal. The taste of charcoal in the mouth is extremely unpleasant and the highest quality grills must be able to avoid this pitfall. People who have a large space in their backyards: At one point we had hundreds of people coming to enjoy football Sunday at our house. My father was known to be the “chefmeister” of our cul-de-sac; neighbors were inviting their other family members to our home for the best grilled foods. This was all thanks to the quality grill my father had purchased at the time; that guy is a savant of throwing a party with the best smoked foods. 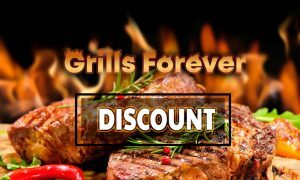 People who already have grills and want a higher quality for lower price: Now you may already own a good grill, however, you want something with more features and options, or maybe cheaper priced and at a higher quality. Look no further than our list, to help you find an affordable new grill that simply outperforms your current one. People on Vacation: There are some particularly awesome portable grills on the market that you can use when visiting the ultimate vacation spots. To be able to grill well on vacation pretty much amounts to being able to get a bunch of girls around your tent for free food. If you know what I mean. Professionals for various competitions: While not as common, professional smokers and grillers need to have the best equipment or risk over-cooked and under-flavored foods. You’ve got to have the best stuff to compete at a high level. Travelers: Some people who are on the road a lot of the time for work must also invest in these high quality products to get the best tasting foods anywhere they may find themselves on a particular day. People who are health conscious: Smoked foods present a variety of positives including making foods less fatty and maintaining more of the vitamins and nutrients that are removed by frying or overcooking. Different meats require different heat settings to be cooked properly. There is a rule of thumb for determining the ideal heat level of the grill at any moment in time without a thermometer. The rule is to carefully place your hand over the grate and start counting. Should you be able to keep your hands over the grill for 5 seconds, you are on low heat. The smaller the seconds you can keep your hands over the grate get, the hotter the grill. If you get a grill with its own temperature gauge though this won’t be necessary. It is important to keep an eye on the grilling work you are doing. Distractions come from every corner; and you do not wish to burn the food. I cannot tell you how many times I over-grilled the meats when my dad gave me the opportunity because some cute neighbor girl would not leave me alone. Focus on the food first, just by doing that you will get even more success with the ladies for your manliness. Attention is key in every aspect of life but especially more so in cooking and grilling. Take your time and avoid costly mistakes. Most experienced grillers can tell just from experience when a meal has been grilled to perfection. Most of us do not fit this category and so we must have a means to verify if the food is perfect for eating. Undercooked meats can make you very sick, but it also easy to overcook meals. A feature-rich cooking thermometer is necessary for non-experts who cannot tell just by poking at the meat, and for the expert that likes everything to be perfect. This is key, you must grill the meat to the right temperature and a thermometer is a fantastic way to tell where exactly you are. No one wants to get sick from food poisoning and this is surely a fantastic way to tell whether your food is well cooked or undercooked. There is one underlying factor that is true for everything on this earth; and it is that everyone and everything will eventually begin to deteriorate. Everything has a date through which it is considered pristine, good, or just still functional. This is as true for everything as it is for grills. Warranties for smokers run anywhere from 1-3 years, with the companies that believe in their products a little more opting for a warranty closer to 3. A common symptom of a grill that needs to be replaced is when it is not performing its functions as well as it used to. A loss in quality of end product is a sure indicator that you need to replace your old grill. Examples of a change in quality can be: tasting metal in your foods, lack of saturated flavors, and perhaps longer heating time to grill food. These are all indicators that your charcoal smoker is getting old. It is possible that your grill needs only to be cleaned properly, not that it needs to be replaced. Saving money is a priority in every situation. To spend it without checking if there are any alternatives is not a financially sound decision. We must first aim to eliminate all other possibilities before spending money on a new grill unless you just want an upgrade. Replacing your smoker completely may not necessarily be the right decision for you. Sometimes it only requires some maintenance here or there. Maintain or repair your smoker, or replace it depending on its age and depending on whether it still performs at a level you wish it to. As you can imagine each smoker comes with a variety of requirements according to what type of fuel or energy is needed to operate it. The following are a few of the ways you can use to power your best charcoal smoker. Lump charcoal is also known as natural charcoal. There is a belief amongst many that this is the first discovered form of charcoal, created by heating logs or trees in a device called a kiln. A kiln is like a sealed cave. This type of charcoal is binder-free and is considered pure wood. This type of charcoal burns very cleanly and purely; making it a plus for the environment. Lump charcoal incinerates unevenly though, first hot then cold. It burns very quickly, and for this reason, it usually must be refilled more often. Binchotan is a Japanese manufactured super lump charcoal which comes in cylinders resembling branches. This type of coal is created from ubamegashi, a type of oak found in mud caves throughout Japan. It tends to burn cleanly according to experts, and does not produce the usual woody flavor to overpower the meats. Due to the amazing qualities and the amount of work put into creating such a beautiful and efficient charcoal, it can be quite pricey. One of the detriments, however, is that it takes a somewhat long time to get this fuel to burn properly. Experts recommend using a torch or an electric lighter and allow at least 35 minutes for the charcoal to be lit. Once it is lit though, it incinerates itself for an extensive period of time. This type of charcoal is mostly utilized in Southern Asia, especially Thailand. These types of charcoal burn quickly in comparison to the Binchotan but they cost a bit less. These charcoals are very rare in the United States, but most hibachi restaurants utilize them for a classic flavor you cannot get with other charcoals. It would require a plethora of coconut shells to get these fires going. Briquettes are treated charcoals that burn hotly and evenly over an extended period of time. They are infused with a fuel like lighter fluid so they can light quickly and easily. Most experts agree that these types of coal are actually the best kind for the casual griller, as they cost less than the others and burn more steadily. The detriment of this charcoal is that it contains a mix of different materials that give off a somewhat heavy smell and taste that can overpower your meats. These are instant light charcoals that contain materials that allow it to be lit very quickly; however, it is debatable whether the materials included are harmful or not when grilling. This is one you must research a bit more before buying since some people argue it alters the taste of the foods or fear the chemicals getting in their bodies. There are several reasons we found that make a good charcoal smoker good. Our research indicated that there are a few factors that concern those that purchase these grills. Customers of every product, from groceries to electronics are most concerned with the actual cost of the products. There are certain similarities between all products, like for example, a lot of products are portable. However, the question is, what other benefits does the machine possess which make it better than most others? These are some of the key questions that the Grills Forever team believe must be answered in order to find out the best charcoal smoker from many. One of the theories you learn from Economics is that people are always looking out to get the best value for the lowest price. No matter what the product in question may be. People wish to pay as little as possible to get the highest quality product, and it wouldn’t make sense any other way. The best charcoal smoker is one that costs little, performs well, and lasts a good while. There are several varieties of grills out on the market. Some are made for big parties and others are made for small gatherings or at least portable enough for you to take along with you to the hotel. A good charcoal smoker is one that satisfies the needs of the user in terms of size. Commercial grillers require a lot more size than personal traveler grillers. This is important because the needs of each customer are different. The best charcoal smoker is one that works best for the person using it. A big grill for a big party and a small grill for smaller parties. Once again, it is important to know what kind of grill you are looking for. There are some that are portable and others are just not. The larger grills are ones that you need for commercial or bigger parties; so these are machines that will not require or usually allow for portability. These are often vertical machines you would transport in trucks. There are those others that come with amazing portability. These are ones that you use for individual or personal smoking. These are machines you can take to your hotel and use at a park. In fact, there are some grills that are handheld, so hypothetically you can grill on the bus on the way home from work. We would not advise that you do this though, because others will surely attack you and steal your meal. Does this machine have a temperature range that cooks meats at an appropriate heat setting? It is a necessity to have a good thermometer to go along with your grill. We will explore further some of the more modern features of each product as we go along. Over the past few years, 4 to be exact, we have tested over 30 charcoal smokers and have found the 10 that we think are the best on the market. None of the products on this list are perfect by any means; yet each of them is the best charcoal smoker in its own rights ensuring highest quality charcoal grilling at the least possible price. We were concerned with finding out several different things about each of these 10 grills. First, we wanted to know how well each machine performed, and further, how durable these grills would be when used for extended periods of time. Also, we wished to know how the charcoals, when burned in these grills, affected the flavors that would be present in the meats that were grilled. We spent close to two months working on testing these products to be certain that they were high quality not just in grilling but also in longevity. This is key; these grills must not only be efficient but also affordable and longlasting at the same time. I remember testing one particular smoker that gave off a strangely metallic flavor every time we cooked in it. We wondered why exactly this was happening, and it turned out that the smoke from the grill was mixing together with poorly chosen metals used to create the smoker, so that the meats tasted strangely metallic, instead of like the barbecue sauce we used. This became an important facet of our work; to make sure that the grills we were using were not altering the taste we were hoping to create. There is nothing worse than doing a lot of work to grill meats only to have the taste be ruined by the machine you are using. You must know that we are a completely independent team looking to recommend the best possible product. We do not in any way wish to suggest you purchase any particular brand and recommend what we think is the best product after years of research. With that in mind please feel free to read our attached report to learn more about the several features each one of these machines possesses. We have analyzed 49 of the most important features for each of the products that are on this list. Our research, as usual, is open for public view in the form of the attached PDF spreadsheet that reviews some of the features that each product possesses. Here at Grills Forever, we simply ask that you like, follow, or friend us on the social media sites we have provided. This will automatically unlock the restriction on the data. As previously mentioned, we researched almost 30 charcoal smokers for this list and compared each one on the basis of 49 positive feature list. This machine, in particular, won the comparison game handily being the best charcoal smoker from all perspectives. It has the most positive features that are conducive to a great grilling experience. For example, it came in first place on things like vertical size which makes it easy to store and easy to clean. It also has a porcelain coating that allows it to be incredibly durable for years. Other features like the ability to use one 1 load of coal for 8 hours of grilling is another quality that makes it endearing for most consumers. The built-in thermometer in the lid allows you to actively see whether your food is cooking at the right temperature. This machine costs under $300 making it one of the most affordable on the list, especially for all the benefits it provides. This machine, with the price and value it provides, blows each product we tested out of the water. The frequency of rating of each product determines how the customers feel about that product. A higher frequency of reviews and ratings means more people love the product. This product boasts the highest amount of reviews out of all the other products that we researched. In the first 18 days it received first 10 reviews on Amazon, another 10 reviews in 8 days, and the last 10 in 16 days. This machine comes with a porcelain-enameled water pan that adds steam to the smoking process, keeping your meat moist and tender. None of the other products on this list can boast of this; that is why this machine is our pick. At a price between $250 and $330, this machine is one of the higher priced on this list. However, do not let this deter you, the makers of this machine created it with so many positive features that the price charged for it is a crime. It is very under-priced for the value it provides. The amazing thing is that the features it has in our opinion should place it around $500, but it costs almost half that. This machine is impressive, and in the two months of us testing it, we considered not testing any more products. This machine comes with a total cooking space of 481 square inches, making it one of the largest cooking areas on this list. This allows you enough space to cook for a good number of people in a party. This machine is best for large scale, even corporate, events that would see you serve an upwards of 50-100 people. Two of these machines would guarantee that a party would be incredibly well fed. This machine was created with big parties in mind, and it is durable enough to support the meals you wish to grill handily. This machine is made for large-scale grilling, and is not the most portable on this list. It stands at 18.5 inches, making it one of the lengthier versions of barbecue smokers on the market. As previously mentioned, this grill is made for large-scale barbecuing and so is meant to be stationary and solid. Gather up your family and friends in your backyard, or transport this machine to a park and gather up your coworkers. Some of the awesome features included with this product include a built-in thermometer, heavy-duty cooking grates, and a water pan that keeps your food moist and tender. This machine helps keep the grilled meat supple, tasty and extremely flavorful. At a tiny $50 this Weber portable model gets the job done anytime anywhere at a great low price. Durable for smoking and grilling this unit's backed by a 10yr warranty..
We were surprised to say the least. The phrase “do not judge a book by its cover” applies here one hundred percent. It is priced very cheaply however it comes with a great number of features that makes it the most budget friendly machine on our list. Speaking of the value this machine provides, it comes with features like a porcelain covered body, a cast iron charcoal grate, and a whopping 10 years of warranty. Easily the best product on this list, it is our budget pick because we found it to be the best charcoal smoker sold at such a low price point. 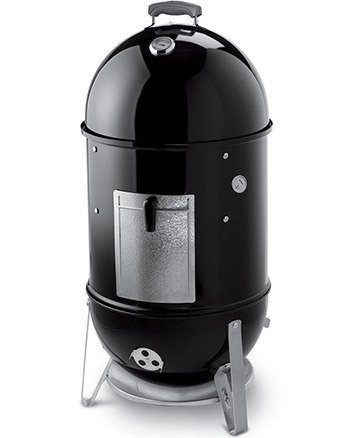 This charcoal smoker is priced under $50, making it the lowest priced and the most user-friendly. This barbecue machine is made for beginners and is incredibly simple to use. This machine garnered 30 positive reviews in 43 days; as you may be able to tell from our attached data report detailing our research results. This is extremely impressive for this product; in less than a month and a half for 30 reviews is an impressive feat. Further, this barbecue machine comes with a One-Touch Cleaning System and easy dump pan for efficient and effective cleaning. The fact that this is even included in a product at this price is what makes it our budget pick. Our budget pick for the best charcoal barbecue smoker is worth every cent paid for it. The features attached to this thing are so amazing we had a hard time choosing another one after it. Below is a review of this product and why exactly it made our list. It really should be our pick but it deserves this budget pick slot even more. The easy cleaning technology by itself makes this product worth much more than what is being charged for it. This is a portable barbecue smoking machine. It is incredibly versatile and durable at the same time. With a price under $50, it is the most affordable and highest value product on the market. The consumerss all rave about this factor of this particular grill. It is so budget friendly that people bought multiple ones just in case one of them broke down or was lost for one reason or another. That is a testament to how great a product this grilling machine is. This portable charcoal grill measures at about 14.5 inches in its interior, making it big enough for a portable machine. This allows individuals to grill enough food for a small party of 3 or 4 at once. The charcoal grill is meant for small jobs and the price charged for this capacity makes it even more impressive. 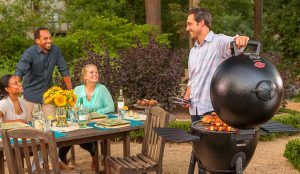 This product boasts a proud history of grilling for tailgating and get-togethers between family members. Cookouts are also an easy place to use these grills. Several consumers boasted about how amazing these machines are to move from one place to another, making it not only very well priced, but also incredibly easy to use. This smoking machine should be rated a ten out of ten. With a 10 year warranty that comes with the purchase of this highly rated product, you are guaranteed a long-lasting use. Thus, the key is to realize that the manufacturers believe in the utmost durability of this product and are so sure this machine will last a long time that they will replace it for you 10 years after purchase. First thing first: please do not get confused by the Tiffin Box Shape. This machine comes with steel plated legs that maneuver to secure the lid in place and a fiberglass-reinforced nylon handle, giving it better durability and ease of transport. The manufacturers were seemingly interested only in creating a product that boasted the highest level of maneuverability. In that sense, it succeeds much more than our budget pick. It is our portability pick because it is a bit more portable than our budget pick. 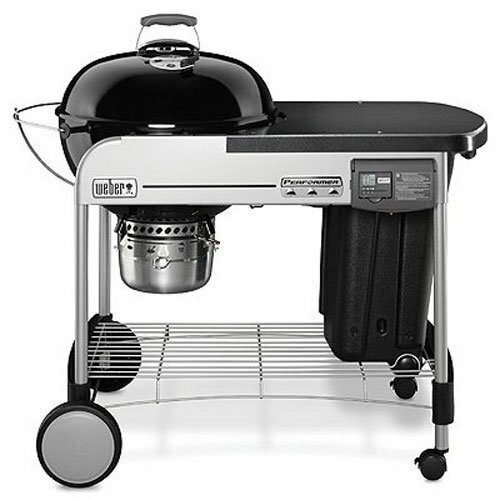 Furthermore, it comes with adjustable dampers and porcelain enameled coating that allow for both heat control and prevention of grill rust. These two features certainly make it an awesome product. Grill rust is a major factor where metallic smokers are concerned, and no one wants a rusty taste along with their grilled steaks. It is also priced under $50, making it one of the most affordable products on the market. Easy to carry, and a stylish design make this product worth every cent paid for it. The manufacturers are known for producing high-quality products at cheap rates. This unit received its 30 highest reviews in a span of 79 days, a slower rate than our budget pick but a relatively highly rated product none-the-less. The standout feature of this charcoal cooker that we found is that it comes with neither nuts nor bolts, which gives it a more solid and non squeaky nature, and nothing to come loose and fall off unseen. It far surpasses other products on the market in this respect. A preliminary look at our attached research results should tell you a great deal about how well this product is made. At the price for which it is being charged and the features it offers, most consumers know that this is a great deal. The following is an honest review of this product according to our research. With a price under $50, each customer raves about how well this grilling machine is made. It is a solid and durable machine that comes without any nuts or bolts, making it a one of a kind machine on this list. The price you pay for it does not even make sense, it is really a crime to pay so low for a machine that gives so much value. We are all constantly seeking the lowest priced items with the highest possible quality. This barbecue smoker meets that requirement. This smoker comes with a 160 square inch rectangular steel plated grilling area that allows you to grill many meals and serve a good handful of people. It is not as spacious as our budget pick, however, it is not smaller by too much. You are able to place about four or five steaks for each grilling cycle. This should keep your guests and fellow tailgaters very happy. This machine is highly touted for its portability, and it is perfect for tailgating and camping. This is a machine you take along with you when you do not want to haul your giant grill from home. Transporting grills is a tough job, so finding a portable smoker that you can take anywhere should be a priority. This machine is literally designed to be hauled from place to place without any hassle. This product comes with a built-in lid hanger that allows you to place the lid on the side of the grill to create a necessary wall against the wind. Also, it comes with a triple-nickel-coated grate that is easy to clean. With a huge grilling surface this Char-Broil model accommodates the largest crowd for about $75. The Offset smoker and grill is your heavy-duty answer to backyard barbecue. 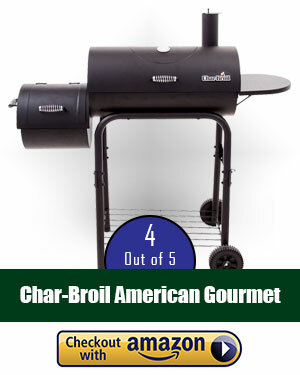 The Char-Broil American Gourmet Offset Smoker is well known in many cooking corners as one of the best products on the market. It is one of the products that boasts an insane cooking surface area. Many users were impressed with how many burgers they could cook at once on this Char-Broil machine. Here is the review for this product. With a price under $75 and the second most number of features on our list, this top barbecue smoking machine is well known for providing benefits well beyond the stated price. It is important to note that this is one of the lowest priced heavy duty machines on the market at the moment. With the amount of added features this machine possesses and the price that is charged, most customers know they have made a steal when they purchase this product. It is also extremely durable which makes it even more purchase worthy. With a surface area of about 290 square inches, this Offset machine is able to hold up to 18 large burger patties at once. You are able to put more, however, we found that 18 patties was the limit if you were looking for “well cooked” patties. It is a heavy duty smoker that also possesses a 140 square inch warming rack that keeps your food nice and warm as you work on other aspects of the process. This is a heavy-duty machine created for high quality grilling and smoking. It is actually one you should be a part of your backyard cooking venture as it is very difficult to transport without a truck or van of some sort. It is good for small to medium scale parties where you do not necessarily need to feed an army. There is a drawer attachment that collects ash and makes it easily removable so that you are not spending an exorbitant amount of time cleaning out the grill. This barbecue smoker makes cleaning a lot easier and that is one of the impressive features of this top machine. 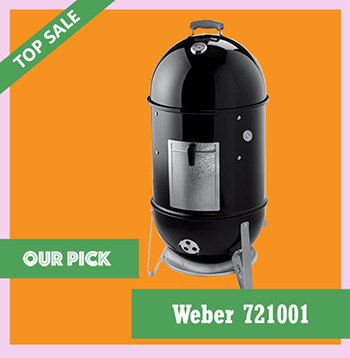 This charcoal smoker is more on the expensive side than other picks, but it is simple to use and has a really big area to work on which you won’t see on other Webers. A sound choice. If the very whiff of charcoal grilling makes your mouth water and you can’t live without your favorite foods grilled to perfection, the Performer Deluxe charcoal grill is made just for you. You will have the luxurious grilling experience with this grill because there is a large thermal set with the heat-resistant work surface and grilling space. This grill has tons of features that make it a bit expensive, which is around $400. The front side of the kettle cart features a removable LCD cook timer that can be attached to the grill or removed to take it wherever you go. The value of peak-free cooking can never be understated, so Weber has included this grill with a built-in lid thermometer to make monitoring the internal heat an effortless process. Looking at those extra features, you will find that the price is very reasonable for grilling your favorite BBQ. The Performer charcoal grill comes with 363 square inches of hinged cooking grate, making the slow cooking process a breeze. All you have to do is just lift up either side of the grate to add charcoal every hour without removing food from the grill. It has a bowl with a lid that is 7.5 inches in height and made of porcelain enameled steel. Enameled steel prevents rust from forming, makes it easy to clean and extend the life of the grill. For the ultimate convenience, it’s easy to slide the lid to the tuck-away lid holder, making adding charcoal or placing food on the grill a smooth and clean experience. There is also a storage container to protect charcoal from the weather elements while keeping it close at hand. Most of the grills on the market usually have only two wheels while some have none at all. But Performer Deluxe has two big wheels on the rear and two 360° rotating small wheels on the front. These durable wheels are there to help you maneuver your grill quite easily. The assembled dimensions of this grill are 43.5 by 48 30 inches and it weighs around 91 pounds. This grills heavy weight and big size makes it difficult to move around. However, you can still take it with you while camping if you have a truck or SUV. The Performer charcoal grill can ignite charcoal briquettes with just a push of a button. Simply place the briquettes into the char basket fuel holders over the igniter and push the electronic ignition button. When the charcoal shows white ash, separate the fuel holders and place each under the hinge part of the cooking grate. You will have the right amount of charcoal for indirect cooking and an easy way to add more every hour until your food is done. The One-Touch Cleaning System is a cornerstone of Weber charcoal grills that easily empties briquette ash into the fully enclosed high-capacity ash catcher where quick and clean ash removal can be accomplished. The phenomenally-sized cooking surface in this Dyna-Glo puts all others to absolute shame. 1196sq inches in 6 movable grates make this heavy-duty the heavyweight champ for $190. This is another heavy-duty vertical barbecue smoker machine for the manly man who likes to grill in their back or front yard for the neighborhood kids. The manufacturers of this top barbecue grilling machine pride themselves on their ability to consistently create first rate smokers that are a cut above all other charcoal smokers on the market. Below is a review of this product based on our selection criteria. Please see the attached excel report to see more of the features that are not listed here. The attached report states that this barbecue smoker costs under $190, making it one of the more affordable heavy duty machines on the market. It boasts of several awesome features which makes it worth the price. To be exact it is one of three on this list that possesses 17 positive features of the several we tested. This is an impressive feat, as most heavy duty machines either cost a lot more or do not come with the same awesome features. This vertical Offset machine comes with 6 separate height-adjustable grates that can accommodate all sizes of food. It boasts an astronomical total of 1176 square inches of cooking surface area and each grate is able to carry over 25 pounds of food. This is key because out of all the machines we researched, this one may be the true heavyweight of heavyweights. As with all other heavy-duty offset machines, this smoker is one that requires a truck or van to move from one place to another. It is not made for portability. Rather, it is made for you to sit in your backyard, smoke and grill meats and watch as your neighbors swarm your house like a pack of wolves. The way it is designed also allows you keep flavor in, so that your grilled food is rife with the flavors you intend. The built-in stainless steel thermometer alerts you when your food has reach the ideal temperature for consumption. It comes with an easy to discern gauge that helps you cook meats to perfection without a worry about undercooking. This is important because food poisoning is capable of killing you. If you would like to smoke your meats to safe temperatures, no matter you’re a beginner or a pro, this Offset vertical machine is for you. 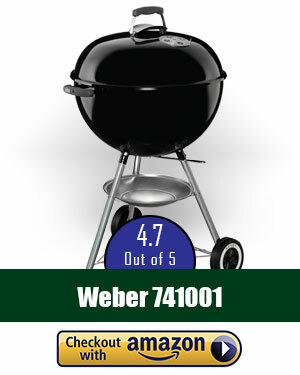 This portable Weber has its own wheels and stands at a comfortable height without compromising maneuverability. The 363sq in. cooking surface is more than adequate for under $100. 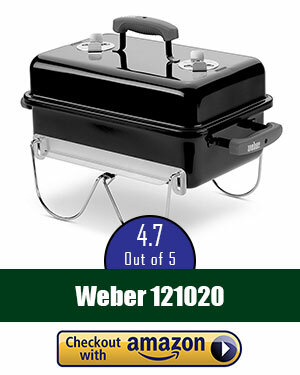 Weber is well known for creating highly portable machines that you can take with you anywhere you go. The other Weber products on this list should be a testament to that. This machine is no different from the others; it is increasingly easy to use and comes with tires at the bottom that allows you to roll it wherever you like. The following is an honest review of this product and why we thought it deserved to be on our list. This machine is priced below $100 and for good reason. It is not as good as our budget pick, we will admit that. However, this machine offers a great value for the price you pay for it. Features like the size of the cooking area and the rust-resistant vents make it worthy of being priced that high. It smokes meats very efficiently because the manufacturers are geniuses of grill making. It comes with 363 square inch total cooking surface area, making it one of the best portables on this list. You are able to smoke about 6-8 steaks on this machine at one time and believe all the steaks will be evenly cooked inside and out. This machine is a lightweight portable machine that comes with wheels to make transporting it easier than ever. You are now able to move the grill from your backyard to your neighbor’s backyard without too much of a hassle. Some customers even raved about how they are able to take these to tailgate parties and wheel them around from tent to tent, giving people meats when the other tents ran out. This product comes with an aluminum vent that does not rust meaning that your machine expels smoke properly and does not introduce a rusty taste into your food. The stainless steel One-Touch cleaning system that comes with Weber products is also impressive. This machine is very well rounded and it makes for an awesome portable smoker, no tailgate required. 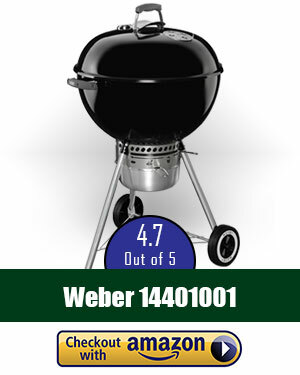 With its removable ash-catcher clean-up is a snap for this well-made smoker grill from Weber. Tires provide full maneuverability and the 363sq in. cooking area comes in under $150. Another portable masterpiece created by Weber, this machine is one of the most well-respected machines on the market at this point. It is incredibly versatile and stores the flavors and tastes you wish to convey so well. Let us now tell you how exactly it performs on our 4 point scale. This machine is priced a lot higher than the other portable machines on this list. It is priced between $120 and $150 placing it in the higher range, especially for portable machines. However, it is well built and very solid and for this reason alone it is one of the best products on the market. Please review our attached report to see more of the great features. This machine is built to hold at least 25 pounds worth of meats that are being grilled. It measures at around 22 inches in diameter and 363 square inches in cooking surface. In terms of steaks, about 7-9 steaks can be evenly smoked at the same time. This highly portable machine is on the higher end of cooking surface area, at least where feasibly portable machines are concerned. Weber designed this smoker to be easily transported from place to place without too much hassle. It comes with wheels that roll comfortably; so that you can even sometimes roll it around, carefully, during the grilling or smoking process should you need to for any reason. It is lightweight and should not be too difficult to roll from one place to the next. With the One-Touch cleaning system, a hinged cooking grate, and a removable ash catcher, you have a product that is extremely easy to clean. This is necessary because you do not want to be spending too much time cleaning rather than enjoying the meal you just cooked. With side-racks and utensil hooks this Char-Griller makes cooking anywhere a breeze. No more juggling your tools and food with this triple-insulated unit's shelves for about $250. The Kamado style grill is well known amongst the Japanese grilling experts as one of the best smokers on the market. It is highly respected as one of the greatest portable smokers available by several experts we checked with. The following is an honest review of this product and its various capabilities based on our four point scale. This machine is somewhat overpriced for it being a portable machine. It costs almost as much as our pick, which is a solid non-portable machine. The price is between $210 and $280 making it incredibly pricey for a portable machine. It does not hold as much food per grate as most other smokers on the market, however, with the rest of its features, we can say for sure that it is a worthy machine. This top stainless steel machine comes with a 447 square inch cooking surface, placing it slightly above the other portables on this list. However, it is built to last, and possesses a removable warming rack that keeps your food as warm and juicy as you like. It comes with a lockable wheel that allows you to push and stop anywhere you prefer, so long as it is not a cliff of some sort. This top stainless steel machine is made to be transported from area to area without too much hassle. The manufacturers charged as much as they did because it is made to be durable for years to come. This smoker comes with a triple-walled insulation system that store heat in such a way that is conducive to evenly heating up the food and efficient use of your heat source. It comes also with a heat gauge made of stainless steel technology. This makes it worthy of the high price being charged for it. This 1063sq in. Char-Griller will host a massive backyard barbecue for the most discerning cook. Char-Griller grills we reviewed are well respected in the smoking and grilling communities because of their amazing build quality, and this heavyweight and solid stainless steel machine lives up to that expectation. This machine is loved by every customer that buys it due to the super heavyweight steel that was used in its creation. Below is how this machine performed on our four point scale. With a price under $170, this heavyweight stainless steel machine is perfect for large family gatherings or parties. It has enough cooking surface area to feed at least 20 people in one go. 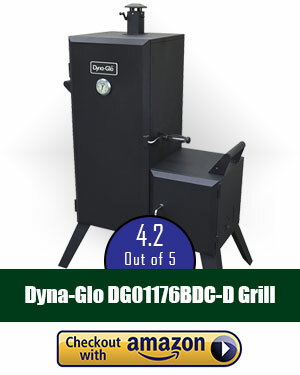 This machine is highly touted as one of the best heavy-duty smokers on the market. Users are raving highly about how efficiently it performs its duties and how durable this machine can be when used properly and with care. It is worth every penny. With an amazing total of 1063 square inches, it triples the amount of food you are able to smoke compared with the portable stainless steel machines on this list. This machine can hold upwards of 15-25 steaks at a time. That is a feat unmatched by most of the other heavy-duty machines on this list. This machine is incredibly successful on the market and that is why it is on our list. It has wheels for storage and maneuverability in inclement weather; however, it must be transported long distances by either a truck or van. It is a huge machine that is meant to be left in the backyard for family parties. With an adjustable fire grate that gives you autonomous control over the heating process, you are literally in control of everything. This machine is not made for new grillers but rather for seasoned grillers who like to challenge themselves. One thing I hate the most is a novice operating a high level grill, they don’t know how to use a smoker and so they always end up burning foods. Here is a list of things you can do to properly maintain your machine so that you are not wasting the machine. First thing’s first, you must always clean your grill before you begin to cook. The last thing you want is for the residue from the last meal to permeate your new meal. That is not only unhealthy but it also makes the new meal taste different than what you had hoped. The experienced grillers will tell you that residue is good for the taste though that is completely not true. It makes it difficult for the machine to work at its peak performance and can harbor bacteria and break down your grill faster, being detrimental to your healthy grilling efforts. Cleaning the thermostat is crucial in situations where you are a rookie and you need it to tell whether your food is properly cooked to the right temperature. If you do not clean it properly, there is a chance it might misread the temperature and then you’ll be left sitting in the bathroom for hours after eating undercooked meat. Clean the ash pan consistently. There is a real danger of having the ash from previous grilling days permeate into the current meal you are preparing. This could make things very dicey and your food may end up tasting like ash rather than whatever flavor you were hoping for. Cleaning the tar and grease is one of the keys to maintain the best charcoal smoker. Cleaning both the inner cooking chamber and the outside chamber is necessary if you want to have healthy and tasty meats that are not contaminated by bacteria from other previous meat smoking experiences. I cannot tell you how many times meat that was supposed to have been cooked ended up giving people a stomach virus because someone forgot to clean the outside chamber. The whole point of this maintenance and care section is to make you aware that there are a lot of ways to ruin the grilling or smoking experience that have nothing to do with burnt meat. There are a whole host of problems with taste, bacteria and safety that must be addressed by cleaning the stainless steel machines thoroughly before and after use. Most of these machines make cleaning very easy anyway, knowing that people would have to struggle with it at one point or another. Preparation is often confused with luck. You must have information before you can make a good decision on anything, from plumbing to choosing the best smoker. 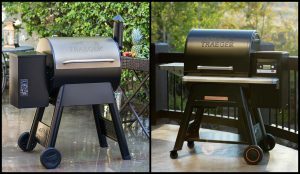 The question right now is, with this list Grills Forever has provided you, will you be able to pick the best charcoal smoker that you can use for years to come? If you believe that we missed anything please let us know on our several social media outlets and we will immediately review that and see how it performs on our four point scale. We truly believe in innovation and we know that companies are always looking for new ways to improve their products. None of the products on this list are perfect, but they are as close as you can get at this very moment. Please feel free to join us on social media and tell us what you think of our review. We would greatly appreciate that feedback.